Deal 1 damage to all enemy creatures in a lane for each destroyed enemy rune. Burn and Pillage is an epic Strength action card. It is part of the Core Set. The art for this card originally appeared on a card called "Raze" in the Gameplay Overview video. "Raze" became "Edict of Azura" prior to open beta. The card's art features a map of Cyrodiil centered on Topal Bay and Blackwood. 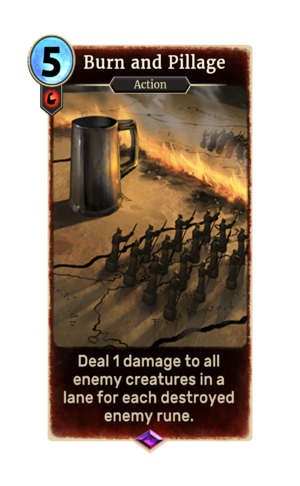 The card originally cost 6 and dealt the damage to all enemy creatures, not just in one lane, but was changed for the following reason: "Previously, Burn and Pillage too often decimated the chances of a player who is on the back foot trying to make a comeback. While we want clear and effective payoffs for destroying runes, the lack of counter-play to Burn and Pillage has been a concern. The updated design makes more sense with the lane system, while still providing the ability to close the door on an opponent who is trying to contest an aggressive strategy."